To make the most of your visit, explore the links below to learn more about how and when to find us, our exhibitions, our collections, tours, educational programs, special programs, special events, and more. Our parking lot is located at the back of the building, at the corner of 6th and Broad Street. Click below to view maps of our first and second level galleries. 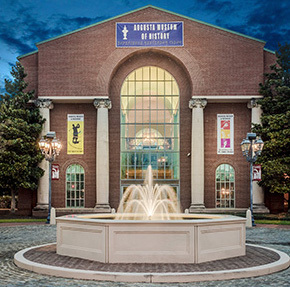 The Museum offers a wide variety of tours and educational programs and resources. Click below to learn about all of them! Please note: For the months of July and August, tours can only be booked Tuesday - Sunday; we are not booking any tours on Monday. We apologize for the inconvenience. Guided Tours are subject to availability of docents/tour guides. During the month of August for Dollar Dog Days, tours on Tuesdays and Wednesdays are $2 per person. Any tours booked during our regular hours of Thursday - Sunday are $1 per person. Please click the link below to explore our signature exhibitions, special exhibitions, interactive online exhibitions, and our past exhibitions. Click below to find out all about the Museum's regular programs and special events! Click below to browse the Museum's online Collections. In our collections you will find a plethora of maps, photographs, and pictures of other artifacts that tell the story of the Augusta area.